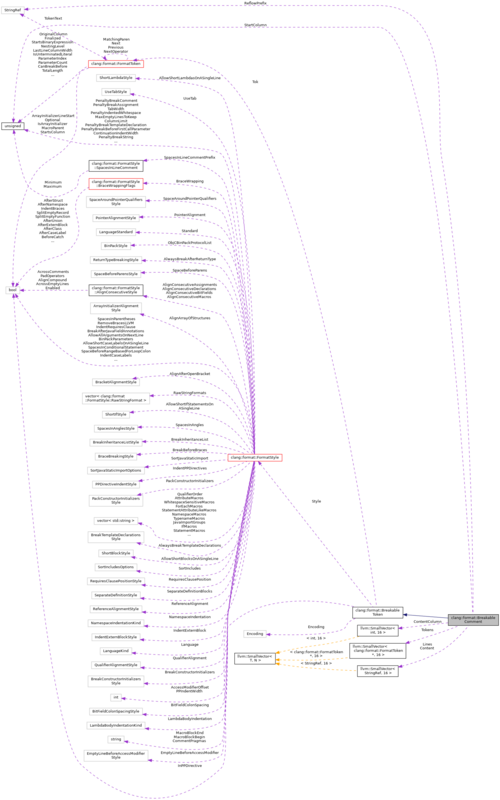 StringRef ReflowPrefix = " "
Definition at line 286 of file BreakableToken.h. Creates a breakable token for a comment. StartColumn specifies the column in which the comment will start after formatting. Definition at line 258 of file BreakableToken.cpp. Definition at line 279 of file BreakableToken.cpp. Definition at line 265 of file BreakableToken.cpp. Definition at line 268 of file BreakableToken.cpp. References Content, clang::format::Encoding, clang::format::getCommentSplit(), Split, and clang::format::Style. 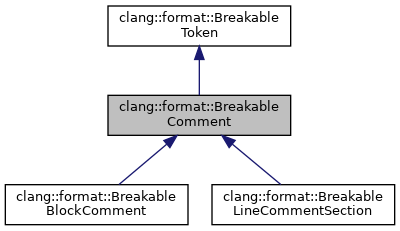 Implemented in clang::format::BreakableLineCommentSection, and clang::format::BreakableBlockComment. Definition at line 297 of file BreakableToken.h. References clang::format::compressWhitespace(), clang::format::getLineCount(), clang::format::getSplit(), and Split. Definition at line 295 of file BreakableToken.cpp. Referenced by clang::format::BreakableBlockComment::mayReflow(), and clang::format::BreakableLineCommentSection::mayReflow(). Definition at line 324 of file BreakableToken.h. Referenced by clang::format::BreakableBlockComment::BreakableBlockComment(), clang::format::BreakableLineCommentSection::BreakableLineCommentSection(), clang::format::BreakableBlockComment::getContentIndent(), clang::format::BreakableBlockComment::getRangeLength(), clang::format::BreakableLineCommentSection::getRangeLength(), clang::format::BreakableBlockComment::getReflowSplit(), clang::format::BreakableLineCommentSection::getReflowSplit(), getSplit(), clang::format::BreakableBlockComment::getSplitAfterLastLine(), clang::format::BreakableBlockComment::mayReflow(), and clang::format::BreakableLineCommentSection::mayReflow(). Definition at line 341 of file BreakableToken.h. Referenced by clang::format::BreakableBlockComment::BreakableBlockComment(), clang::format::BreakableLineCommentSection::BreakableLineCommentSection(), clang::format::BreakableBlockComment::getContentStartColumn(), and clang::format::BreakableLineCommentSection::getContentStartColumn(). Definition at line 319 of file BreakableToken.h. Referenced by clang::format::BreakableBlockComment::BreakableBlockComment(), clang::format::BreakableLineCommentSection::BreakableLineCommentSection(), getLineCount(), clang::format::BreakableBlockComment::getRangeLength(), clang::format::BreakableBlockComment::introducesBreakBeforeToken(), clang::format::BreakableBlockComment::mayReflow(), and clang::format::BreakableLineCommentSection::mayReflow(). StringRef clang::format::BreakableComment::ReflowPrefix = " "
Definition at line 354 of file BreakableToken.h. Definition at line 344 of file BreakableToken.h. Definition at line 329 of file BreakableToken.h. Referenced by clang::format::BreakableBlockComment::BreakableBlockComment(), clang::format::BreakableLineCommentSection::BreakableLineCommentSection(), and tokenAt().